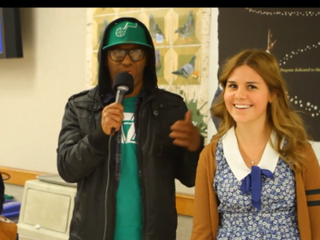 In a video entitled, “What BYU Students know about Black people”, Dave Ackerman, a white student painted in “black face” interviews his peers, and many Brigham Young University students struggled to answer basic questions, like when Black History Month occurs. “January?” one student answered. “Is it November?” Another answered. … But the revealing video offered further insight to the student body’s depth of Black history or lack there of as many struggled to identity black historical figures outside of Martin Luther King Jr. or issues like “getting Black into the schools” as one student phrased it. One student had a hard time describing the demographic of people he worked with at an Alabama mission and went with “colored people". But the thing that actually made the supposed-to-be-humorous video cringe-worthy was not that the students interviewed struggled with the facts. Those are easy to learn (and we could all probably stand to brush up). But changing attitudes is another story, and what made us abruptly stop laughing was the dismissive, ridiculously narrow and condescending take on current black culture that seemed to underlie the exchanges — from the interviewer's use of blackface (why?) to the unabashed use of punch lines about rap and grape juice as touchstones of the African-American experience. That, even more than the blanking on black-history facts, is the part that shows us how far we really have to go. Read more at ABC Action News.